This summer I've read a couple of books about oil and the countries that supply it. Both were excellent. 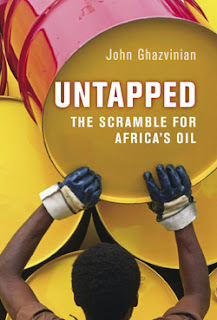 The first was Untapped, by John Ghazvinian, a freelance journalist with a Ph.D. in history from Oxford. Untapped primarily focuses on sub-Saharan Africa. Ghazvinian visited twelve countries, including Nigeria, Angola, Equatorial Guinea, and Chad. To get a flavor of Untapped, see the excerpts that appeared in the Virginia Quarterly Review and Slate. China has forgiven literally billions of dollars of bilateral debt from African countries in recent years - something Western debt-relief campaigners have tried for years to get their governments to do. It has also set up scholarships allowing some 10,000 African students to be educated in China, and sent hundreds of doctors and teachers to the continent. In 2005 even agreed to build that desperately needed road between Brazzaville and Pointe-Noire [Congo-Brazzaville's port city], something no amount of Western aid has ever accomplished. I'm not sure I buy this, but I don't have a good counterexample. And while China's tacit approval of human rights abuses in the Sudan and Zimbabwe is appalling, I'm glad to see that they've reached their limit in Zimbabwe. A Chinese official recently told the UK's Foreign Office Minister that in view of the crisis in Zimbabwe, China now will only provide humanitarian aid.